The Vancouver International Marathon Society has thirteen trophies that celebrate the winners of the Vancouver Marathon. 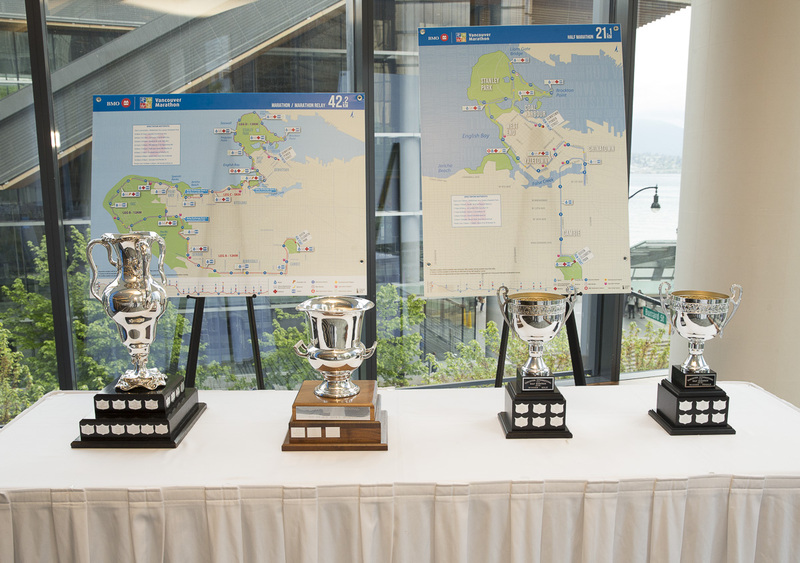 Trophies include the Overall Male and Female champions of the Marathon, Half Marathon, and 8KM, as well as the Top Canadian Marathon Male and Female, the Top BC Male and Female, Top Masters Male and Female, and the Leslie Truelove Memorial Trophy. The “Chandler” trophy, awarded to the Overall Top Male, was originally awarded in 1909 to the winner of the Marathon Challenge Cup – William Chandler. Chandler’s son donated the trophy to the Vancouver Marathon in 1986. The Vancouver Marathon recognizes international and local runners and welcomes runners of all ages and abilities. The Masters Trophies recognize the top male and female in the 40+ age category. The Leslie Truelove Memorial Trophy previously recognized the first male finisher in the 50+ age category. The Vancouver International Marathon Society offers an Elites Athletes Program for the BMO Vancouver Marathon. Learn more.